Earth’s Oxygen Engine: Is the Invisible Ocean Virus Ecosystem Threatened? When you mention rich ecosystems that are vital for life on Earth, people tend to think of rainforests, but ocean plankton are actually just as crucial. The microscopic beings that drift on the upper layer of the oceans are globally referred to as "plankton"; together they produce half of our oxygen, act as carbon sinks, influence our weather, and serve as the base of the ocean food web that sustains the larger fish and marine mammals that we depend upon or draw delight from. "Beyond the cutting-edge science that was developed thanks to our collaborative work with the Tara Expéditions Foundation, this adventure is also about showing people all over the world how important the ocean is for our own well-being," says Eric Karsenti, director of Tara Oceans, from EMBL and CNRS. The scientists captured viruses, microbes and microscopic eukaryotes — organisms with complex cells, from single-cell algae to fish larvae — from major oceanic regions. They compiled their genetic material into comprehensive resources that are now available to the scientific community for further studies. "This is the largest DNA sequencing effort ever done for ocean science: analyses revealed around 40 million genes, the vast majority of which are new to science, thus hinting towards a much broader biodiversity of plankton than previously known," explains Patrick Wincker, from Genoscope, CEA. EMBL's high performance computing was essential in compiling this comprehensive catalogue, which is estimated to be derived from more than 35 000 different species whose genomic content had been mostly unknown to mankind until now. "In terms of eukaryotes, we sequenced nearly a billion genetic barcodes, and found that there is a greater variety of single-cell eukaryotes in plankton than was thought," says Colomban de Vargas, from CNRS. "They appear to be much more diverse than bacteria or animals, and most belong to little-known groups." Thanks to novel computer models, the researchers were able to predict how these diverse planktonic organisms interact. Predictions were confirmed via selective microscopy observations. "When we mapped how planktonic organisms — from viruses to small animal larvae — interact with each other, we discovered that most of those interactions are parasitic, recycling nutrients back down the food chain," says Jeroen Raes from VIB, KU Leuven, and Vrije Universiteit Brussel. This map is a first step towards a better understanding of the dynamics and structure of the global marine ecosystem. 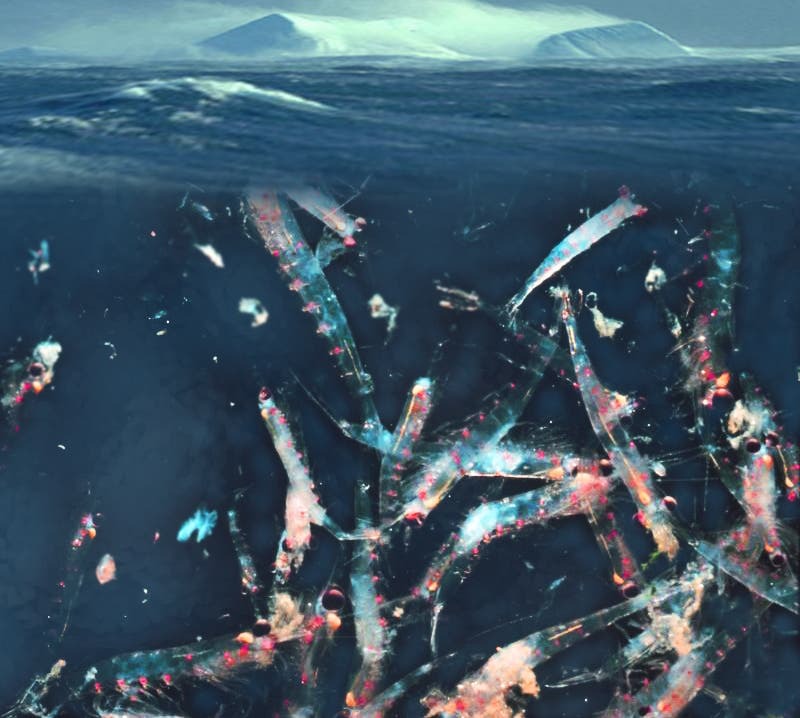 In addition to biotic interactions, the scientists studied how environmental factors — such as temperature, pH, and nutrients (amongst others) — influence the microscopic organisms floating in the ocean. "We found that, at depths still reached by sunlight, temperature was the main factor that influences the composition of prokaryotes (bacteria and archaea) communities," says Peer Bork from EMBL. "Different sets of organisms come together depending on the water temperature." The scientists also showed that the Agulhas "rings" — a natural barrier that draws the line between the Indian Ocean and the South Atlantic — separate plankton communities. "It's like plankton goes through a cold wash cycle at the tip of South Africa," says Daniele Iudicone from the Stazione Zoologica Anton Dohrn. "The current forms huge swirls that drastically mix and cool the plankton riding it, thus limiting the number of species that manage to cross." "In addition, we now also have a global picture of marine virus communities, which allows us to confirm an idea that had been proposed a decade ago, but never proven," explains Matthew Sullivan from the University of Arizona. "Viruses are produced in local 'seed banks' and then ride the ocean currents, so you end up with different cocktails of viruses in different places, even though the overall diversity of viruses in the oceans appears quite limited." Understanding the distribution and the interactions of the plankton across the oceans will be very useful for predictive models necessary to study climate change. The uniqueness of the Tara Oceans 'eco-systems biology' approach is to have sampled the world's oceans systematically across all domains of life, from viruses to animals, and including a rich variety of environmental data. The data generated sets a baseline, on a global scale, to evaluate the impact of climate changes on oceanic ecosystems in the future. "The finding that temperature shapes which species are present, for instance, is especially relevant in the context of climate change, but to some extent this is just the beginning," says Chris Bowler, from CNRS. "The resources we've generated will allow us and others to delve even deeper, and finally begin to really understand the workings of this invisible world."